The Chuwi HeroBook is a very inexpensive 14-inch notebook from China. How good can such a cheap laptop be? That’s what you’ll learn in this review. 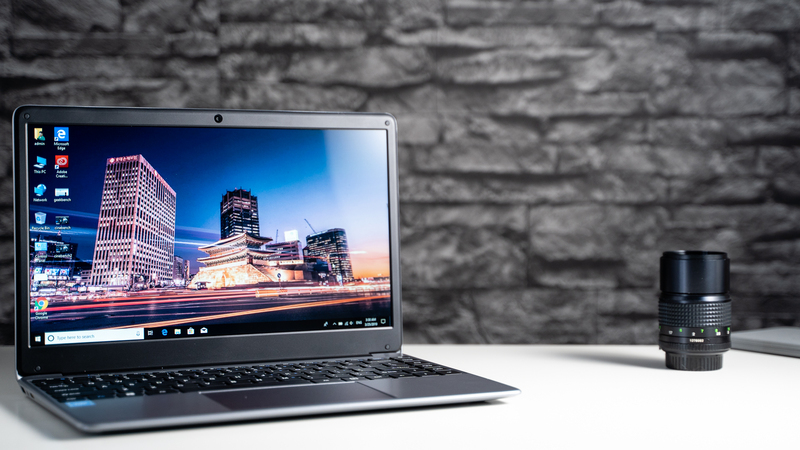 The Chuwi HeroBook is one of the cheapest Windows notebooks you can buy. While it usually costs around 270 US Dollar, you can often get it as a deal for around 200 Dollars. For that, we get a 14-inch screen, an Intel Atom x5 quad-core processor, 4GB of RAM, and a 64GB internal storage. Well, how good can such a cheap notebook be? That’s what you’ll find out in this Chuwi HeroBook review. By the way, you probably won’t be able to get the Chuwi HeroBook locally. Instead, you can import it from China using shops like GearBest. They are the ones who send me this review unit. Let’s start this review with the design and build quality. On first glance, the Chuwi HeroBook looks like every other notebook. It’s has a mostly silver body with black bezels around the screen. As you might expect at this price, it has a full plastic body. The build quality is fine but because it’s plastic, it certainly does not feel high-end. The notebook is 2.1cm thick and weighs 1.48kg. Considering what it is, I think that’s fine. On the left side, we get a USB 3.0 Type A port, a connector for the power plug, and an HDMI out. There is another USB 3.0 port, a standard headphone jack, and a microSD card slot on the other side. So, we don’t get a USB C port. On the bottom is a very useful feature. We get an SSD extension slot down their so you can insert an SSD without having to open the whole body. It can fit M.2 2242 and 2280 SSDs. Sadly, I don’t have one lying around so I did not test this. A speaker is hidden between the hinge of the screen. The sound quality is acceptable but not good. It’s usable for YouTube but like usual, there is no real bass and voices can be scratchy at maximum volume. We also get a 0.3-megapixel webcam located above the screen. And, as is common with 0.3-megapixel cameras, the quality is pretty bad. Let’s check out the keyboard. Since the Chuwi HeroBook is a 14-inch device, we’re getting a full-size keyboard here. The layout of the keyboard is pretty good with a large Shift- and decent Enter-key, as well as separated Arrow-keys. I’ve been able to type on this keyboard fast without having to get used to it. It’s a normal decent keyboard. With that being said, you will feel a difference between this and premium notebooks. The keys have a decent travel, but feel cheaper than I am used to from pricier laptops. It’s hard to describe but compared to those the keys feel a bit softer maybe. Anyways, for this price, the keyboard is totally fine. Underneath the keyboard, we get a touchpad with integrated mouse-buttons. Actually, the touchpad is pretty good. It is big enough and it is a precision touchpad and supports all multitouch gestures that Windows has built-in. As I mentioned earlier, the Chuwi HeroBook has a 14-inch screen. It has an aspect ratio of 16:9 and a resolution of 1366 x 768 pixels. Well, on 14-inches, that resolution is very low. And if you are used to looking at full HD screen, you will notice that especially texts and icons don’t look as sharp. However, with this price, I could live with that low resolution. But sadly, the rest of the screen is not that great either. It is not an IPS panel. That means that the viewing angles are not wide at all. In fact, especially when looking from the top the picture breaks apart fast. Colors look fine if you sit directly in front of it. The brightness is alright for inside but a bit too dark to use comfortably outside. I guess the screen is alright if you don’t want to spend a lot of money. This is clearly one reason why the HeroBook can be so cheap. If you need a great screen, this is not the notebook for you. Chuwi is shipping the HeroBook with an Intel Atom x5-E8000 quad-core processor. Additionally, we get 4GB of RAM and a 64GB internal storage. That’s eMMC flash-storage, so we don’t get an SSD here. The Intel Atom x5-E8000 is similar to the x5-Z8350 that we’ve seen in tons of Windows tablets a couple of years ago. However, the E8000 is just a bit more powerful. It’s clocked at 1.04GHz but can go up to 2GHz. Well, as you can see in my Geekbench and Cinebench benchmark comparison, the performance of the Chuwi HeroBook is indeed just a bit better than typical Atom x5 tablets are. However, the performance is not great. This is one of the cheapest notebooks you can buy – and that also means it is one of the weakest performance wise. In real life, the performance is a bit better than what I am familiar with from those Atom x5 tablets. This E8000 is a bit faster – but I think a major reason for that is the low-resolution screen which does not need as much processing power. The performance of the HeroBook is fine for standard office work. I wrote this review and other articles using this notebook and Microsoft Word. That works totally fine. Windows 10 itself runs well too. I also surfed the web using Chrome a lot. And, most of the time, the performance is good enough for that too. Especially if you surf the web just lightly with a couple of tabs. However, when visiting demanding websites, you can see some stuttering. And that includes OneDrive and YouTube, for example. You can watch HD videos smoothly, but when switching to full-screen view and back, you might have to wait a second until it does. Another app I tried is Adobe Photoshop. I’ve been able to install and run it just fine. And it is usable for occasional simple edits. However, let’s be honest here. This certainly is not a great notebook to get if you want to use Photoshop a lot. It’s fine for occasional things but not more. It also seems like Photoshop would prefer a higher-resolution screen. You also shouldn’t get the Chuwi HeroBook as a gaming machine. With that being said, there obviously are older games and games aimed at mobile platforms that do run on here. You can play games like Asphalt Xtreme or Modern Combat 5 just fine. But more demanding games like Fortnite do not run at all. Let’s get to its battery life – and that is one of the highlights of the Chuwi HeroBook. In my standard battery test, it got a runtime of just over 9.5 hours. I’m always looping the same HD video at medium brightness and turned-on WiFi for these reviews. In my battery comparison chart, you can see mostly tablets. But still. Considering how cheap this notebook is, those 9.5 hours are a great result. Again, I think one reason why the battery last so long is the low-resolution screen that also is not that bright. So… that has an upside too. Alright, that’s my Chuwi HeroBook review. Is it a good notebook? Well, it obviously depends on what you are looking for. Especially when considering its cheap price, the design, keyboard and especially battery life are very good. The performance is not outstanding, but it is usable for office work and light web browsing. However, I wish Chuwi would have chosen an IPS screen. You can get used to it, but obviously, it’s not a good screen. I can live with the performance, but the screen is a downside. I remember paying over 500 Dollars for tablets with similar and sometimes weaker hardware. But that was a couple of years ago. We’ve come a long way since then and it is nice to see that you can get a decent notebook for around 200 Dollars now. So, I can recommend it, if you don’t want to spend more and just want a simple notebook with a decent keyboard for some office work or so. It’s usable for that. With that being said, if you spend around 70 to 100 US Dollars more, you can get a laptop with an Intel Gemini Lake chipset and an IPS screen. The performance is noticeable better with those and I think it’s worth it to invest a bit more for most. A very interesting alternative can be the Teclast F6 Pro if you’re looking for a more powerful machine.